E3 2011: Day One Photos – Booths, Games, Babes and More! That’s right boys and girls it’s E3 time again. So, you know what that means, right? It means we will have a bunch of game trailers, videos and more to share over the next couple days. It also means photos. Lots of photos. We like photos. Photos tell a story. They tell a story of E3 full of exotic booths, exotic games, exotic trips to far off lands and exotic booth babes. That’s right, the booth babes are back this year and we’ve got pictures to prove it. So, click on through for what will probably be the first of at least a couple more galleries of photos showing off the sights, sounds and even smells of E3 in Los Angeles. Well, maybe not the smells. That would be a little difficult. Click through for all the excitement. E3 2011: Microsoft Announces More Kinect Titles, ‘Dance Central 2′, ‘Halo 4′ Trailer and More! Even if you can’t be at E3 this year, don’t worry. It’s Monday and we’re not even there yet either. Oh the benefits (and hindrances) of working on a site that doesn’t just cover games. We’ve also got Apple’s WWDC announcements today and a bunch of other stuff for a Monday. But getting back to Microsoft, our pals over at Geek Week have put together a nice list of the highlights of this year’s Microsoft News briefing at E3. And being the nice guys that we are, we’ve gone ahead and listed it right here for your use and enjoyment (with a few added bits and comments as wel). On my second day of the Penny Arcade Expo up in Boston, I took to the show floor to check out the booths of what I considered the three biggest and most anticipated games at the convention. One of these games is a follow-up two amazing titles for the Xbox 360. One is the sequel to the best first-person puzzle-platform of our time. And the third is a game that most, if not all of us, never expected to see released. Gears of War 3, Portal 2, and Duke Nukem Forever were all booths that never ceased to cause lines and buzz all throughout the weekend. Check out my favorites after the jump. Everyone assumed that Epic design director Cliff Bleszinski’s appearance on The Jimmy Fallon Show Wednesday night was to announce a third installment to the Gears of War franchise. But when he canceled and Justin Bieber had to take his spot, suspicions arose. Today, however, Kotaku reported that this advertisement showed up on the Xbox 360 Dashboard, stating that Gears of War 3 will be released sometime in April 2011. Oopsies, Microsoft! 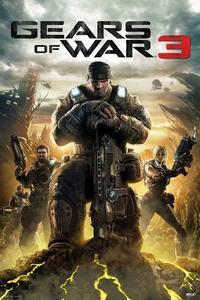 The third installment is a follow up to 2008’s Gears of War 2, which broke sales records by selling over 2 million unites in it’s opening weekend. The game also set online records, as they clocked over 1.5 million players logging on to play the game at one time. While the game hasn’t officially been announced by any other sources, rumors of the game have been abound for some time, including some new features like underwater combat and mech suits. Whatever the case, we’re sure to hear something when Bleszinski appears on Jimmy Fallon on April 12th.